Hardwood flooring offers the unmistakable charm and timeless beauty only found in real, authenticl wood. They are never out of fashion and add real value to the home. Here at Quality Flooring, you’ll find the absolute best selection of name brand hardwood flooring, from American oaks and maples to exotic hardwood flooring like Brazilian cherry. We offer a wide variety of wood species in many different plank widths and colors for formal, classic and country interior decors. 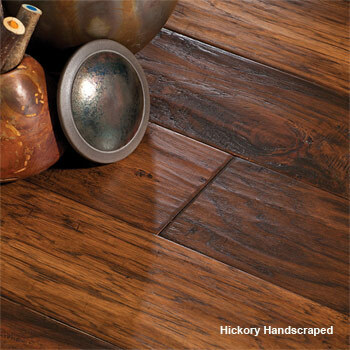 Nobody in Columbia MS beats our hardwood flooring selection, values and service. Through advancements in manufacturing of wood floors, today's hardwood floors are more durable, easier to maintain and adaptable to many different living areas within the home. Our engineered wood floors allow homeowners to use hardwood flooring in areas of the home that they would never have considered in the past. We also offer a wide range of 3/4" solid wood floors and all of our wood floors come with the latest factory finishes that will last for years and carry the full manufacturer's warranty for both construction and finish.